Chinese President Xi Jinping hosted U.S. President Barack Obama for a state visit on Wednesday, in what was Obama’s second visit to China since assuming office (and his first since 2009). Amidst widespread reports of increased U.S.-China tensions, the two leaders tried to emphasize the cooperative side of the bilateral relationship, but ideological tensions are increasingly becoming a major factor in the relationship – a worrisome sign for what is widely acknowledged as the most important bilateral relationship in the world. 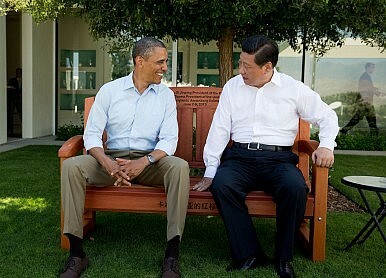 First, the good: the U.S. and China had several deliverables to showcase at the Xi-Obama summit. First a new visa deal will allow for 10-year, multiple entry visas for businesspeople and five year visas for students. The streamlined visa process is a step forward in promoting people-to-people exchanges, which both governments routinely hold up as a key to improving mutual trust between the U.S. and China. The two sides also inked a climate change deal including commitments from both sides to reduce emissions. As my colleague Zach argues, China’s targets aren’t exactly new – the promise to reach peak carbon emissions by 2030 had been aired earlier this year — but the fact that China is formally committing to a carbon dioxide cap is a breakthrough that bodes well for the 2015 climate change conference to be held in Paris. The bad: the two sides continue to have divergent visions for the future of the Asia-Pacific region, and despite nods to cooperation, there’s little indication that Beijing and Washington have found concrete ways to cooperate. China used its opportunity as the APEC host to lay out a vision of Asia-Pacific unity – economic and ideally political – that would lessen U.S. influence in the region. Meanwhile, Washington, alarmed at this vision, has chosen to stonewall these initiatives rather than trying to influence them from the inside. As a result, we’re seeing battle lines drawn instead of cooperative projects. Countries can choose the Free Trade Agreement of the Asia-Pacific against U.S. opposition or the Trans-Pacific Partnership, which excludes China. Countries invited to join the Asian Infrastructure Investment Bank have to choose between Chinese cajoling and U.S. pressure. The trend toward fragmentation rather than cooperation in the Asia-Pacific suggests the strategic competition between the U.S. and China is getting worse – and historians since Thucydides himself have long known what lies at the end of that path. And finally, the ugly: there are several problems with comparing the U.S.-China relationship to the U.S.-USSR relationship during the Cold War, mostly notably the fact that America and China have closely intertwined relationships and exchanges in every field, from business and trade to student exchanges. However, a Cold War-style ideological battle is growing increasingly prominent in the U.S.-China relationship. This, more than anything else, poses a major threat to the “new type major power relationship” that Xi Jinping has advocated for. The ideological differences are obvious: the U.S. sees itself as a model democracy with an obligation to defend human rights around the world; China is a one Party system that demands the right to squelch all threats to CCP dominance without outside interference. That essential dichotomy has been in place since the normalization of the relationship in 1979, but it’s increasingly becoming a problem as U.S. and Chinese interests diverge in other fields (especially in their visions for the Asia-Pacific). Ideological tensions sharpened under Xi Jinping, as he has chosen to fight a public battle against Western influence in everything from think tanks to art and literature. Beijing has also repeatedly and openly blamed the current protests in Hong Kong on interference from the West, including the U.S. government. As Xi fights against Western “poisons” at home, he is also increasingly combative in his meetings with Western leaders. At his press conference with Obama, Xi took a forceful stance against the Hong Kong protests. He also gave no indication that China is willing to address U.S. concerns about the issuance of press visas for journalists. Journalists having problems getting visas need to look at themselves “to see where the problem lies,” the Washington Post quoted Xi as saying. Xi’s comment is similar to remarks made by Chinese ambassador to the U.S. Cui Tiankai in an interview with Foreign Policy. Regarding foreign journalists who had problems getting visas, Cui said, “If they really want to see changes, they could start with themselves… They know what to do and they know how to do it.” The concordance here suggests this is China’s governmental line of the issue of press visas: journalists must toe the line or get out. If last year’s high-profile will-they-or-won’t-they visa dance becomes an annual occurrence, the U.S.-China relationship will suffer. The two countries should respect each other’s sovereign and territorial integrity as well as political system and development path, instead of imposing one’s will and model on the other, which is the important condition and foundation for the two countries to have a healthy, stable and sustainable relationship. This message has always been part of China’s definition of “new type major power relations,” but usually China is content to use the more anodyne phrase of “mutual respect,” a more palatable short-hand for the same idea. Laying the issue out so clearly draws attention to the fact that Beijing has a serious problem with U.S. “interference” in its affairs – and continues to believe that Washington is working behind the scenes to alter China’s political system. Meanwhile, it’s politically impossible for any U.S. administration to meet Xi’s demands. To do so would mean dropping the human rights aspect of the U.S.-China relationship, something Congress (and the American public) would simply not stand for. And the question of respect for China’s “territorial integrity” also grows problematic if Beijing expects the U.S. to accept its territorial claims in disputed regions, including maritime disputes with U.S. allies like Japan and the Philippines. A ‘New Type of Military Relations’ for China and the USUS Pressures China to Kill Asia-Pacific Free Trade Agreement TalksUS, China Talk Ebola, Islamic State, and South China SeaAlthough Unhappy With US Sanctions on Iran, China Won’t Fall Out With WashingtonWill Xi Jinping Visit North Korea This Year?